Lightly oil or spray an 8" x 8" baking dish or 2-quart casserole. Add bread cubes. In a medium bowl, bled eggs, milk, vanilla, and sugar. Pour over bread cubes. Stir gently to wet all bread with egg mixture. Top with fruit. Cover with plastic wrap and refrigerate until all liquid is absorbed (30 mins), or as long as overnight. 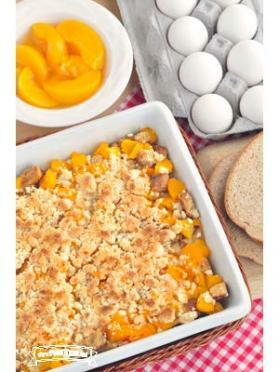 Just before baking, remove casserole from refrigerator. Preheat oven to 350 degrees F.
Make the topping: In a small bowl, combine the softened margarine, sugar, and flour until crumbly. Remove plastic wrap and sprinkle topping over fruit. Bake until completely set, and starting to brown, (160 degrees in the center), about 34-40 minutes. Serve warm.